There has always been a play between the actual symmetry of the picture shape (square, horizontal, diamond, shape, etc.) and the symmetry of layout, which opens the depicted forms to the use of color -- to sound or harmonize in an expressive way. COLOR BY ITSELF can't make great paintings. It must be organized, composed, orchestrated. In his ability to reconceive pictorial organization, Noland revealed a unique genius. This is the side of art that belongs to drawing and design. Because it is more readily analyzed than color, the discussion of it tends to take up more space, as it does here below. But despite the space accorded, remember that formats in Noland are designed always to serve and support relations of color. Noland has taken illustration out of art altogether, leaving behind what Bernard Berenson referred to as "decoration." If illustration is the literary, storytelling side of art; decoration is the purely visual; it deals in colors, rhythms, repetitions, arrangements. In Aesthetics and History Berenson observed, "there is no room for the ugly in art as decoration, but only in art as illustration. Decoration gives its own value to objects regardless of what they are in actuality." The mainstream of modernism has progressively abandoned illustration in favor of decoration. This process involved simplifying or "abstracting" what Roger Fry and others have called "natural forms." This abstracting tendency was attached particularly to Cubism, especially as practiced by artists like Picasso, Braque, and even Mondrian. When the center of art shifted to New York in the '40s, this abstracting Cubism was inherited from the School of Paris. By the 1950s, it was under pressure from many American artists. Jackson Pollock, Mark Rothko, Morris Louis, Adolph Gottlieb, Robert Motherwell -- all made abstract paintings which had a vague, symbolic association in their imagery. So did Noland's early "Circles," which were surrounded by painterly penumbras. Realizing that these target-like motifs could stand on their own as simple, geometric layouts, by 1960 he'd turned to unadorned unsymbolic circles. These latter concentric circles were just circles; every vestige of representation or allusion in the drawing of them had been expunged. Graphic allusiveness had been taken over by color. This happened about the same time that Jasper Johns painted his famous "Targets." Although these were superficially similar to Noland's "Circles," they served different ends as Johns' subsequent development has made plain. Like much of Surrealism, Johns' was an art of painterly illustration, a popular appendage to the mainstream of modernism; his "Targets" were representations of actual targets, just as his "Flags" were representations of the Stars and Stripes. This phenomenon isn't new. Attachments to the mainstream of modern art have usually been accompanied by illustration, providing a shallow art that can be explained and "understood." Such understanding is of little use in Noland's art. It addresses itself exclusively to appreciation. Geometry has always been implicit in pictorial design, but in the 20th century it has become more and more explicit. Russian Constructivists and some members of the Bauhaus used it strictly. Of these, Piet Mondrian's paintings of the 1930s and '40s were probably the most prominent and influential, but Mondrian's geometry serves different ends than Noland's. In Mondrian's later paintings primary colors locate positions and rhythms in a geometric layout -- in a sense local color serves or clarifies geometric design. Mondrian's color varies little from picture from picture to picture, his layout does the work; Noland's layout varies little from picture to picture, his color does the work. Noland uses color to infuse feeling into what would be otherwise bland, geometric compositions. Barnett Newman and Mark Rothko were innovators in the realm of geometric abstraction from the generation after Mondrian. Both used color in large, resonant areas. Their art moved geometry into a scale that carried color sensation more effectively, but both resorted to evocative associations more than Noland did. This is suggested by even the title of Newman's "Stations of the Cross" series, while Rothko's development and practice demonstrate a similar evocative interest. There's nothing inherently wrong with this - Adolph Gottlieb and Morris Louis in their less geometric ways also used evocative images - but it may have restricted Newman and Rothko. Certainly for artists of the '60s this kind of abstracting seemed to pose as many problems as it solved. If Noland's art abstracted from nature, it did so after the fashion of music, allusively and elliptically. Because of this, it was able to use color with extraordinary freedom. Expression came from relations among colors as much as from sheer, optical resonance. The characteristic picture format of modern painting has gradually moved away from an illusory "window" to something more immediate, a picture seen against the wall as an emblematic panel. This kind of picture is more of an object -- and less of an illusion -- than the traditional easel picture. Its objective presence was hinted at in Cubist collage. From there it developed through Matisse, Mondrian, Pollock, Louis, Noland, and Olitski to the recent deep relief painting of Lawrence Poons, Susan Roth, John Griefen, and James Walsh. Despite its declarative presence, it's more emblematic than sculptural and developed from the emblematic character of imagery in Cubist painting. Throughout its development it has nodded in the direction of bas-relief, but only to acknowledge a common physicality. 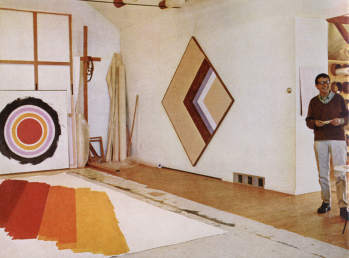 square "diamond" and, on the floor, a large unstretched narrow "diamond"
In the '60s and '70s its foremost innovators were Noland and Jules Olitski. In Olitski's hands, the panel picture inclined to monochromatic displays of texture or atmospheric color in narrow rectangular formats. This narrow format was used frequently by abstract painters in the 1970s and '80s. Because it pushed two sides of the painting close to the center it held the picture interior flat, preventing it from dissolving into flaccid illusion. Noland was instrumental in the development of this new emblematic panel picture. From the beginning, his art was uniquely sensitive to picture shape and format. His first series placed an emblematic image -- usually a group of concentric circles -- at the center of a square canvas. In his subsequent "Chevrons" the emblematic image appeared to be intersected by the top corners of the picture rectangle. By the time of the "Stripes" and "Needle Diamonds" the emblematic image had become the panel itself. From Picasso to Pollock picture shapes had been passive containers for an accumulation of pictorial units. Their paintings emphasized their flatness within relatively traditional confines. Noland turned the tables, making this accumulation of units dictate the shape of the picture itself. After the "Chevrons" picture shape became an active element in his pictorial expression. By taking variety away from internal shapes, Noland made color take its place. This called for a new kind of composition. Internal shape became a matter of widths, lengths, and related interactions. In many cases these determined the overall picture shape. This emblematic panel format was reinforced by a new sense of scale. Geometric abstraction before Noland was in the scale of traditional easel painting. Because of this it carried with it an aroma of depiction. Scale in Noland's painting was felt in relation to the human body rather than to the easel's imaginary window. His pictures weren't necessarily large in total area. They were often long, narrow verticals or horizontals, as if the panel picture could declare generosity of scale in a single dimension. A size of about 6 ft. to 7 ft. in one dimension was common, though by no means constant. This scale relates to the height or outstretched arm reach of a person and suggests an analogous presence: one encounters the emblematic panel as a presence upon the wall rather than an opening into it. The fundamental unit of Noland's formats is the band or stripe -- often a reflection of the picture shape itself. This unit is an anonymous carrier for color and paint. Noland's discovery of it in the late '50s was essential to his breakthrough. The band has the virtues of continuity and anonymity. Continuity, in the form of attenuation and elongation, makes the shape less "sculptural" -- more of a line and less of a shape. As a result it tends to appear as a color area within the surface rather than an object applied to it. Anonymity means the shape avoids representation and evocation. Repeated bands and symmetrical layouts stabilize Noland's paintings. In this Noland's art differs from that of an earlier colorist like Matisse. Matisse avoided symmetry and repeated pattern. He backed away from it, I suspect, from the fear of surrendering pictorial tension to simple decoration. Noland met the problem head on, using color to add tension and ambiguity to symmetry and decorative repetition. These often took the form of implied directional movement through a sequence of colors like a chord and counterpoint combined. To use a phase of Clement Greenberg's, Noland "used the decorative against itself." FROM IMPRESSIONISM THROUGH Cubism, modernist painting embraced the conventions of the easel picture. However, by the late '40s, many artists had begun to work on a larger scale. As Jackson Pollock put it, his drip painting didn't "come from the easel." After WWII, many artists began to enlarge the freedom and spontaneity of the sketch by drawing from arm and shoulder rather than forearm and wrist. But while there was talk at the time of the "portable mural" (no doubt influenced by the Mexican muralists), the very large painting remained a tantalizing ideal rather than a common achievement. By the end of the decade, the general size of the easel painting had enlarged substantially, but by no means to mural scale -- apart, that is, from the handful of large Pollocks which set a new standard. That standard was tantalizing but tenuous: even masterpieces like One and Autumn Rhythm seem today a bit uncertain about the scale of drawing in relation to the size of the picture itself: in Autumn Rhythm it seems a bit large and forced, in One perhaps not large enough. Of Pollock's contemporaries, even artists like Rothko and Still, both of whom worked with simple expanses of color, couldn't raise them effectively to mural size. The flaccid late Rothkos in the Rothko Chapel in Houston are a case in point, and Still's large paintings were best when they were taller than they were wide. Barnett Newman could, on occasion, stretch out horizontally, but by the early '60s his color and formats had stiffened. Generally speaking, mural-scale bigness impressed but didn't quite convince. A major breakthrough in scale came with the "Veils" of Morris Louis from 1958 and '59. Here a new kind of paint application (a variety of pouring or staining into unsized canvas) obviated one of the main problems that beset very large paintings, that of getting the scale of application to relate meaningfully to an enlarged picture format. Louis's "drawing" didn't depend on arm and shoulder, let alone hand: transparent washes, restrained color, bilateral symmetry and mirror imaging helped carry this off, freeing his pictures from the scale of hand and brush. The "Veils" picked up where Pollock left off; in a sense, they were the first paintings that seemed naturally large. Although Noland used the same materials as Louis, he didn't -- at least not until the late '50s -- work on so large a scale. His "Circles" didn't demand mural scale as had Louis's "Veils" and "Unfurleds"; in fact they were somewhat limited in size by their square formats. In practice, the width of a square painting is governed by its height and hence subject to ceiling height and canvas width. Because of these constrains, the "portable mural" has tended to be wide rather than tall and avoids the square. With the "Chevrons" and "Needle Diamonds", larger Nolands began to appear, but prior to the "Stripes", his very large paintings didn't fully inhabit their size. With the "Stripes", scale became exact in an unprecedented way. In effect, Noland dismantled or deconstructed the horizontal and vertical coordinates of the picture rectangle. It was no longer seen as a rectangle to be compartmentalized, but rather as two vectors: vertical stack and horizontal extension. Because horizontal bands were less inclined than vertical ones to separate into foreground and background, they allowed - even insisted upon - lateral extension. In the process, Noland's art became one of expressive scale and proportion. Color areas stretched to become horizontal panels, narrow bands extended into long color channels. Many of the "Stripes" pictures were very wide, often much wider than they were tall, taking on the general proportions of the frieze but rejecting its horizontal sequencing. In this they were as revolutionary as Picasso's collages half a century earlier. ALL REPRODUCTION IS ILLUSION, whether with photographs or not. A photograph can't capture is the actual surface of a painting, nor can it present the actuality of its scale. In Noland's work, the paint surface is deceptively vital. Despite its seemingly even application, it's enlivened by "touch", by some acknowledgment of the painting's physical presence and its support ­ usually canvas or paper. The camera creates another surface entirely, at best only an approximation, to which it adds color distortions. To add to the confusion, most reproductions exclude frames and present pictures coterminous with the surface of the paper they're printed on. But real paintings and don't do that -- they project (usually between one and 2 inches.) from the wall and are isolated from the wall by frames. Added to this, the actual size of a picture in relation to a viewer can't be conveyed in reproduction. These material "conventions" are of the utmost importance and Noland unabashedly exploits them. Most painters who abandoned the frame of in favor of a break from convention have paid a high price -- generally with flaccid presentation and a painting that is little more than surface "stuff ".